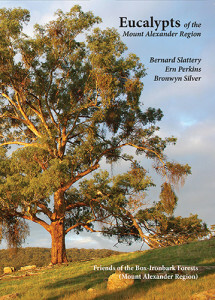 Ballarat. At the first stop some curly leaves were investigated and contained psyllids. These insects live under a covering called a lerp. At home I plugged in the trusty $50 digital microscope (from Aldi) and looked at the tiny insect. Eight field nats left Gillies Street and the numbers swelled to 13 in the low cloud and drizzle at the base of Mt Warrenheip. 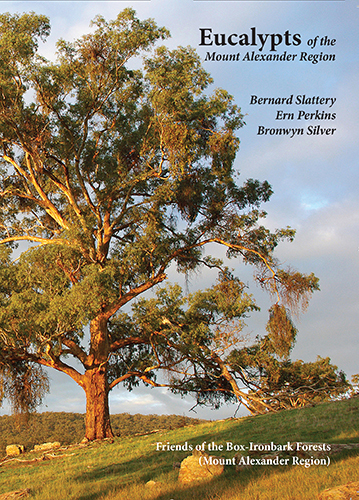 We set off through the wet grass to examine the Blue Gums growing on the west-facing slope. We searched for buds and gum nuts on the ground and what we picked up was confounding. 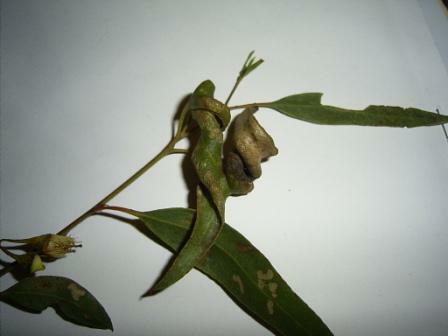 Some nuts were sessile on stem (indicating Eucalyptus globulus ssp bicostata Eurabbie), buds found were attached with flattened peducles (E globulus ssp psuedoglobulus Victorian Eurabbie). Further investigation is necessary to find out if the trees have been planted.